Liverpool midfielder Lucas Leiva battles against Leeds striker Chris Wood (right). Liverpool’s Lucas Leiva has emerged as a target for Newcastle United. The club is considering a move for the Brazilian midfielder, who has spent the past decade at Anfield. Leiva was signed by Rafa Benitez at Liverpool. 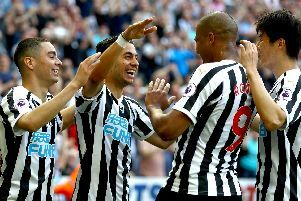 And the Gazette understands that Newcastle are investigating a move for the 30-year-old, who is interested in returning to former club Gremio in Brazil in this summer’s transfer window. United manager Benitez is looking to strengthen his midfield ahead of the Magpies’ return to the Premier League. Liverpool will reportedly allow Leiva to leave Anfield this summer if the deal is right for the club and player. Speaking this month, former international Leiva said: “There was an offer from Gremio in January, but I wanted to complete 10 years at Liverpool. “Now in the window we had a conversation, but nothing official. Benitez, however, could persuade the midfielder to extend his stay in English football, having forged a strong working relationship with him during their time together at Liverpool. Lucas made 31 appearances for Jurgen Klopp last season. And Liverpool are yet to receive a firm approach for the holding midfield player, who is rated in the £4million bracket. Newcastle have already signed winger Christian Atsu from Chelsea this summer. Benitez is keen to see more new faces arrive before his squad reports back for the start of pre-season training on July 3.